The relocation and construction of the newly-renamed Gender and Sexuality Center on Upper College Road will be a step-up from the current one located in Adams Residence Hall, but subsequently the building will no longer be in the middle of student life on campus. 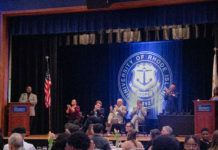 Visitors to the university will have the chance to see URI’s values and priorities when first arriving on campus, but some are concerned that with the building being so displaced from the rest of student life the involvement and purpose on campus will be forgotten. The new location doesn’t seem to be a concern at all students of the LGBTQ community, however. Â Chris Francis, president of the Gay-Straight Alliance on campus reported that he feels that the centers new location right across from the Women’s Center is a positive thing. “A lot of my friends go there as well, and I feel that as long as its still somewhere on campus, people will still go to it,” Francis said. The new location was actually the closest of all the options with the easiest access to students, according to the Director of the URI Gender and Sexuality Center Dr. Annie Russell. Â Russell also believes that the new location will be better for commuters that face issues when gaining access into Adams Hall. The aesthetics of the new center is an upgrade for all students, but the new welcoming designs don’t come without meaning. The stonewall that makes up part of the new Gender and Sexuality Center’s faÃ§ade was chosen intentionally as a nod to the Stone Wall Riots of 1969. The conference room behind it will be known as the Stonewall Conference Room in recognition to the unofficial beginning of the LGBTQ civil rights movement in the United States. The center will also feature three gender-neutral bathrooms, office spaces for staff and students, a separate area for group meetings, a kitchen and lounge area, and multiple entrances. One of these multiple entrances will be a discrete entrance at the back of the building for students who may be questioning their sexuality or not ready to come out, not to suggest that being a part of the LGBTQ community is something to be ashamed or embarrassed of. Students will also have the choice not to label themselves at the new center. Â Rather than keeping the LGBTQ title, URI is thinking big and broadening their scope with the Gender and Sexuality Center. Â The name change was decided after more than a year or debating and discussion between students, faculty and staff in order to emphasize the development of multiple and intersecting identities surrounding gender and sexuality in the new center. Regardless of how you identify yourself, all students are welcome to attend the grand opening of the Gender and Sexuality Center on May 6.